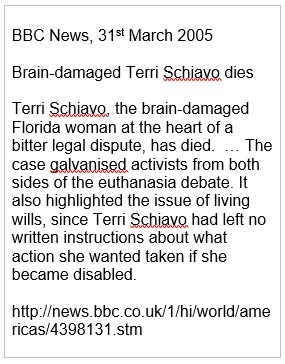 Earlier this year, we learned of the bitter legal battles over Terri Schiavo. The case centered on the different interpretations of her wishes by her husband and parents. Like Terri, I have no “living will.” So I thought it would be a good idea to find out about them, with the usability of the forms in mind. In 1996, Hoffmann, Zimmerman, and Tompkins did a study of living wills and found that 41 percent of the patients filled in the form inconsistently, giving contradictory instructions, and up to 45 percent filled in the form in a way that did not match their intentions. So are today’s forms any better? Can we learn some general lessons about usability from them? Living wills are legal documents. I wanted a sample of documents that were comparable, so I looked to the US where they are governed by state law but those laws are somewhat similar. I chose six US states: Alabama, Georgia, Maryland, New Mexico, South Carolina, and Wyoming. I thought they would give me a good spread of approaches. For each state, I hunted for a State Government source for the appropriate forms for creating a living will in that state. My detailed notes on each form are in a table at the end of this article. Understand the various terms used and their meaning in your state. (Comprehension—or “understanding the task”). Decide what your wishes are with respect to the health care treatment you receive if you become unable to express those wishes at the time. (Decision—or “finding the answer”). Communicate the decisions, preferably by appointing a person whom you trust to act on your behalf and discussing the wishes with them. (Communication—or “discussing the answer”). Repeat the process from time to time, so that your expressed decisions continue to align with the current wishes. (Revision—or “keep it up to date”). These four steps: comprehension, decision, communication, and revision, are implicit in many types of long-term forms tasks such as deciding what to do with your retirement fund, pension, or superannuation. But they are outside of most people’s everyday experience of forms. Living wills are especially problematic because they require people to make decisions about the unpleasant topic of serious illness. A quick quiz: What are these, and how are they used? Not quite sure? Well, try this explanation from South Carolina: “Entry of a Do Not Resuscitate Order is, however, one means of effectuating a patient’s Advance Directive for the withholding of life-sustaining procedures when the conditions set forth in the Advance Directive are met” (South Carolina http://www.state.sc.us/dmh/804-97.htm). Although the point was not obvious to the South Carolina legislature, I think that as usability professionals we can agree that these legal terms require plain language explanations. “When Does a Living Will Work? It’s all somewhat trivial, isn’t it? To answer this question, a user has to think about complex medical procedures such as artificial nutrition and then think about whether or not they wish to have those procedures in unpleasant medical circumstances. It’s a far more challenging task than the book purchase. My view is that many people will require some help, preferably a structure that takes them through the steps that may be involved in the decision. All of the forms that I reviewed offer some wording that I interpreted as an attempt to offer some help to users. Although these instructions are well-intentioned, the user’s best strategy would be to ignore them and to concentrate instead on the underlying, more important task of decision. Therefore, these instructions need to be reworked so that each question is self-contained: the rules about how to place marks and about routing should be right there in the question. What most people will need is decision help: something that guides them through the thought processes to come to an answer. Usability lesson: When providing help to users, are you offering mechanical help or decision help? Decision help is more useful (but harder to write). I hope you will agree with me that the Maryland one is far better. But now think about the next step. Imagine opening that conversation with someone in your family. Does that seem hard to do? It certainly does to me. None of the state forms that I investigated offered any help at this point. Some people may decide that they would prefer to give up on a living will rather than tackle the discussion with the family. Usability lesson: Sorting out a usability problem at a detailed level may not be enough. We may have to stand back and consider the context to see if there are wider problems. Consider a Jenny, a 20-year-old who has no impairments and has rarely suffered a day’s illness. Jenny has an active social life, loves to dance, and works out regularly. She thinks about Alice, her 80-year-old grandmother who can barely walk, is going blind, and has hearing problems. Alice rarely leaves the house, is losing her short-term memory, and the highlight of her week is the phone call from her daughter. Jenny looks at Alice and thinks: “I’d rather die than live like that.” Alice does not agree. She has her comfortable home, a dutiful daughter, and her long-term memories are a great companion for her. If Jenny suffered some devastating disease or accident that parachuted her overnight into the problems of advanced age, then her current “I’d rather die” might still have force. But what if the impairments sneak up on her? Will she still want to die or will she gradually find zest in her life within whatever limits start to apply? Usability lesson: Users’ goals change over time. Think about supporting that process of change. This article was first published in User Experience, Volume 4 Issue 3.